Terror films, a film production and distribution house, has slated several films to release, this Halloween season. One of their stand-outs is titled The Dark Stranger. 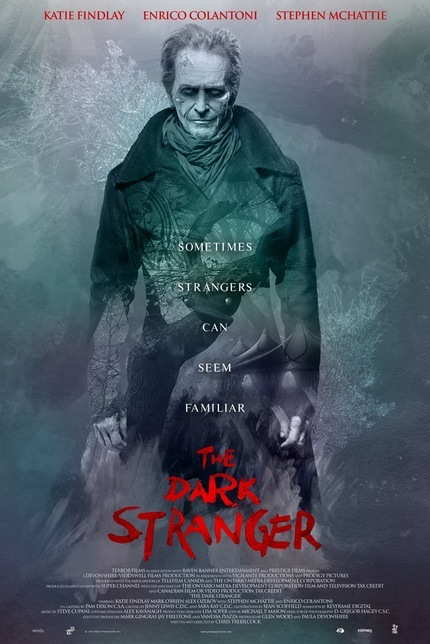 Starring Katie Findlay (After the Dark, 2013) and Stephen McHattie (Pontypool, 2008), a new clip has been released for this horror film, titled "Stranger Danger." The clip shows character Leah (Findlay) struggling with terrifying visions. Film fans can preview the clip here, exclusively, on Screen Anarchy. From the Terror Films' website, The Dark Stranger revolves around the very traumatized Leah. Afraid to leave her home, she invests her time in the creative arts, by writing a graphic novel. But then, a character from the novel comes to life and terrorizes her. Reality and fantasy fuse in this psychological thriller. The Dark Stranger will be available this October. This title is slated for a Video-on-demand release, through the following platforms: XBox, Amazon Instant, Google Play, VuDu, Playstation and several more. October 14th is the official release date. And, horror film fans can view more of the title here as Leah confronts her fears, in this "Stranger Danger" clip, below. Release Date: October 14th, 2016 (VOD). Cast: Katie Findlay, Stephen McHattie, Enrico Colantoni and Jennifer Dale. *The Dark Stranger will also be available on Cable and through DVD retailers, at a future date. McHattie has always been one of my favourite character actors. For the longest time I have hoped that he would be cast as 'Burke' in a movie of Andrew Vachss's long-running series of novels.